Gali Qaasim Jaan was wrapped in fading darkness. A few tattered curtains hung listlessly on some doors. Pigeons flew overhead and some kids fought over marbles. Somewhere a goat tethered to a threshold, bleated timidly.This was Ballimaaran in the walled city of Delhi more than 150 years ago where one of the greatest masters of Urdu Poetry, Mirza Ghalib once lived.Mirza gave a whole new dimension to the world of Urdu Poetry, and has been hailed as one of the the true Masters. My desire to visit Mirza’s Haveli was soon going to be realized. Regardless of how well one knows the streets of Delhi, it is no joke to locate Gali Qasim Jaan where Mirza’s Haveli still stands. It is a crying shame that what once was a two-storey Haveli has been reduced to barely a neglected remnant. Years of government indifference has led to severe misuse of the place. Finally, the Archaeological Society of India took matters into its own hands and two ushers now look after the Haveli. Visiting hours are observed for tourists who long to feel the air, which still echoes with Mirza’s recitals. Ballimaaran, where the Haveli is situated - is predominantly a Muslim area and the lanes are barely wide enough to allow one rickshaw to pass. The scenes have obviously changed from the times of Mirza. Hustle and bustle of honking vehicles and endless shopping hoards have taken over mercilessly. It was a somewhat pleasant day despite the overnight rain, which often leads to humidity in the month of June. I found it dismaying to discover that even the localites did not seem to know the whereabouts of Mirza’s Haveli. A pity indeed. After riding around on the rickshaw puller’s whims for a while, I was finally able to locate Gali Qasim Jaan where the Haveli is located. A plaque by the front entrance gave a brief introduction of the place and listed the visiting hours for tourists. A big man stood guard and waited eagerly for the clock to strike five. There was another man inside the Haveli who didn’t make things any easier. After convincing the so-called staff that I had come all the way from the United States, I was allowed to spend a few moments inside. Despite the short amount of time I spent there, my camera clicked restlessly. The Haveli was more like a large compound with Mughal style columns and walls that were studded with portraits and large frames. Mughal style bricks were clearly visible and invoked the memory of old times. As soon as one enters, a huge portrait (expanded) of Mirza’s couplets in his own handwriting can be seen hung on the sidewall. Wall of fame (as I address it) studded with photographs and illustrations was further ahead. Ustaad Zauq, Abu Zafar, Momin Khan Momin, and other noted contemporaries of Mirza have been creatively arranged in the vast collage. Another wall shed some light on Mirza’s personal favorites. His trademark “Balon wali lambi topi” and “Lamba kurta” were listed as amongst his favorite attire. “Taley kabab, Aam, Achaar, Daal Murabba were a part of his favorite cuisine”. 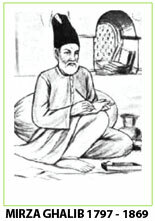 He also took avid interest in “Patangbaazi, Chausar and Shatranj“, as the list portrayed. A large sketch of Mirza hung surrounded by his selected couplets, and featured him with his trademark huqqa. The only room with a door, set slightly aside from the rest of the Haveli featured a large frame with Mirza’s last ever taken photograph. With high ceiling and a dim lamp that hung listlessly - simply took my breath away. On either side of the room hung various pictures and portraits of Mirza’s Mazaar and other facets of his life and time. This was the place where women once sang celebrating the birth of yet another child. A child who would not survive. Here is where Mirza stayed lost in thoughts for hours - penning down verses. 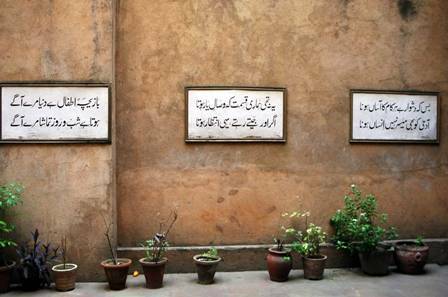 This was where Mirza Ghalib lived. The man who changed the world of Urdu Poetry forever. As I was leaving, I couldn’t help but wonder about the man whose genius people could never recognize. Not when he was alive, and not when he has departed. Even after the High Court’s judgment in 1997 that an impressive memorial be built at the place of Mirza Ghalib’s haveli, no heed has been paid as mere cosmetic repairs have been carried out in the name of the restoration. Mirza’s Mazaar at Hazrat Nizamuddin has met the same fate if not worse. I wonder whether these crumbling monuments would survive the neglect and indifference of people and authorities. Incidentally, as Rahul Pandita adds in his memoir of Ballimaaran, Hasrat Mohani’s Ghazal “Chupke, chupke raat din ansoon bahan yaad hein….” was written on a terrace in Ballimaraan by a youthful Mohani who had fallen in love with a girl living in the next house. She would often come to the terrace on the pretext of drying clothes. Ballimaaran, which stood witness to the bloodshed during the revolt of 1857, has seen it all. 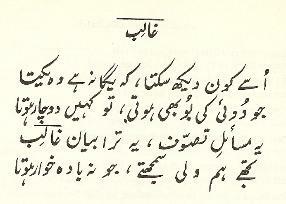 From the days of Mirza Ghalib to the current times. It still stands tall as if serving his master, Mirza himself. I stepped out with the imagery of the Haveli engrained in my heart and soul.